These lists enter a new century and leave behind the ‘90s. That decade saw the public- and by extension gamers- facing a new political order. The Fall of the Berlin Wall set off geopolitical changes which made some doomsday scenarios obsolete. At the same time we found new scenarios, many soaked in a religious fervor. The approaching millennium brought with it a kind of dread. But more readily reflected in games, especially in the late 90’s, was the world’s crash potential. By the end of the decade Y2K hung over everything. There’s a significant drop of ultra-low-budget apocalyptic films. We still have some (Cyborg 2), but not nearly as many as the previous decade. We also get more remakes and adaptations. We also see that briefly Kevin Costner could use his clout to make back-to-back post-apocalyptic blockbuster failures. As with movies, we see a drop-off in lower-budget “Men’s Adventure” apocalyptic books and series. Again, we still have some, but they’re outliers. Two sit-coms based on the apocalypse? Next you’ll tell me that someday we’ll have two competing post-Armageddon comedies in the theaters. Again the Japanese seem much more comfortable with post-apocalyptic backdrops in their fiction. Alternately manga/anime might represent a much larger slice of their entertainment output, distorting comparisons. Oh, Xenogears. The game where they get 2/3rds of the way through and realize that’s taken a month of play, so they jam everything into the last half-hour. HE'LL SEE THE BIG BOARD! 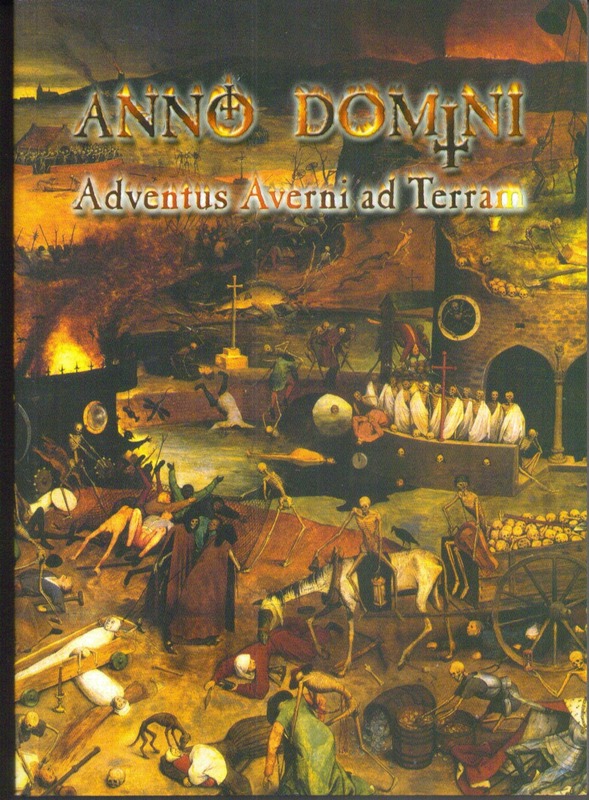 A Spanish role-playing game, Anno Domini offers a medieval apocalyptic vision. This is the first game on to fully embrace that setting, though Sweden's Gemini ('98) comes close. We'll also see a "Neo-Medieval" game later on this list. That's striking given how important visions of the Apocalypse are to Western Medieval and Early Modern art, literature, and culture. In Anno Domini, the first millennium brings with it an invasion by the Devil. Two hundred and fifty years later, small pockets of humanity survive in the wilderness. Demons command the cities. Players take the role of one of the faithful (Jewish, Christian, Muslim). The character sheet has a lot going on, comparable to World of Darkness density. Anno Domini seems to have a single supplement, La Marca de los Profetas (trans. The Mark of the Prophets), an adventure module. It's worth reading the rear copy for deadEarth. The bare, text-only, black cover starts, "If you've just picked up this book you've probably got a few questions." It then lays into a surprisingly generic description of the game: focused on survival, skill-based, simple, flexible, and realistic ("Hundreds of hours of research have gone into the world of deadEarth"). It also mentions free stuff available on their website. But most compellingly, it ends with this pitch: "You can become a permanent part of deadEarth. deadEarth is the only role-playing game which will permanently incorporate your characters into the game once they reach legendary status." To be fair, having a significant and rich online presence in 2000 probably puts publisher Anarchy Ink ahead of the game. deadEarth offers a post-holocaust game aimed towards "realism." So like maybe The Book of Eli, Fallout, Mad Max?...wait no, it also has extensive radiation mutation tables and other high weirdness. Huh? Reviews for this game are generally, well, bad. Dyson's Dodechahedron has a nice rundown you can see here. His review on RPGNet's pretty damming as well. And if you Google for Gareth Hanrahan's review...well, that's a treat also. In short, the game's apparently a train wreck of ambition, intention, and contrary execution. If you like reading threads about those kinds of games, and seeing some interesting counter-points, consider hunting this down online. Oh Gamma World, here you go again. You return once more, but with terrible timing. Gamma World 5e has TSR's Alternity System under the hood. It also has the dubious distinction of being the last official Alternity-based product released. It didn't even come out from TSR. 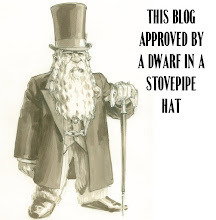 Instead WotC released it after their purchase of the humbled RPG giant. 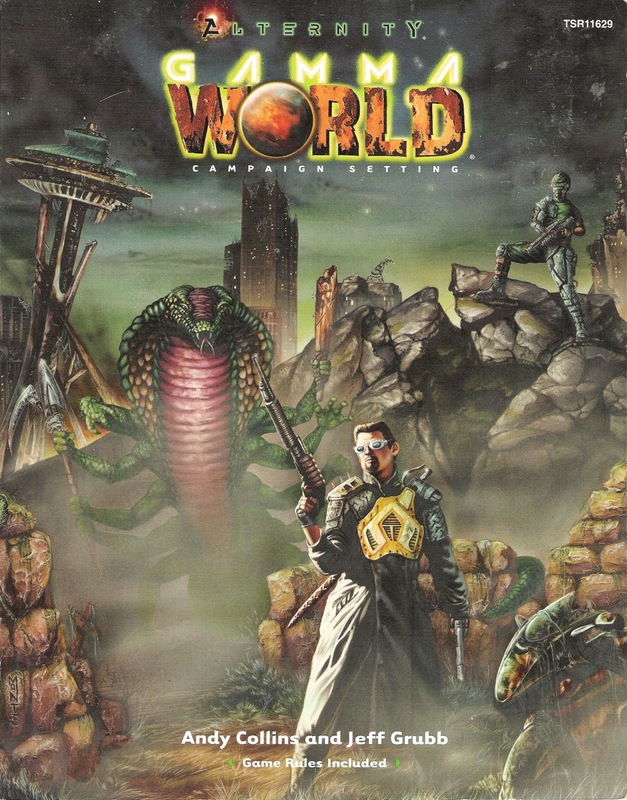 This Gamma World actually hit the shelves a month after WotC announced their closure of that system. There's a significant time gap between this edition and the previous one. Gamma World 4e had hit in 1992, revising the mechanics to fit with AD&D 2e. However, within a year TSR cancelled that line, leaving the module series unfinished. Gamma World 5e though built on Alternity, doesn't require that core book. Instead it offers a complete game. The art shift was the first thing that hit me when I looked through this. 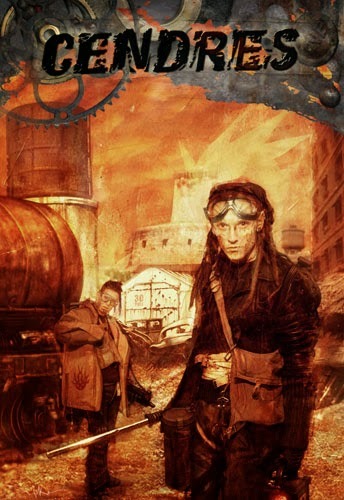 The cover has a black duster-clad dude with a distinctly cyberpunk look. Raven Mimura's interior art is grey-scaled and pencil-drawn. There's not that much art and little of it iconic. Overall it feels restrained. We've got some mutant animals and interesting monster designs, but the gonzo is gone. Weirdly for me calling it "Gamma Terra" and describing a real-world blasted Seattle grounds the game too much. At some point in the setting’s evolution the 25th Century backdrop fell away. Instead we have a Cataclysm in the 21st Century driven by alien(?) invaders. That aside, the game's done well. Clean layout, streamlined design. Mutations and drawbacks can be randomized or point-bought. There's a decent amount of setting material and some adventures in the back. It makes you wonder what WotC might have done had they kept this line going. As a coda, in 2002 Johnathan Tweet wrote "Omega World" for Dungeon 94/Polyhedron 153. In only 40+ pages, Tweet presents what's effectively a d20 version of Gamma World. Tight, fast, gonzo, and randomly mutating, many reviewers sing the praise of it. Yet the following year would see an actual version of d20 Gamma World but not from Tweet and not from WotC. BTW for a funny and NSFW overview of the various Gamma World editions, check out Head Injury Theater. We've seen mutants, demons, zombies, and robotic overlords on these lists. But this game creeps me out more than any of those. KidWorld takes place four years after the Plague. Most adults died in that outbreak, and it blinded those who lived. Desperate, unseeing survivors tried to enslave those with sight- children- creating a schism. Many escaped, and humanity is now made up of scattered communities- kid enclaves, adult camps, slaver communities. And the Plague is still present. As the children grow, they know that they too will lose their sight. Lord of the Flies. Blindness. Battle Royale. "Miri" from Star Trek. 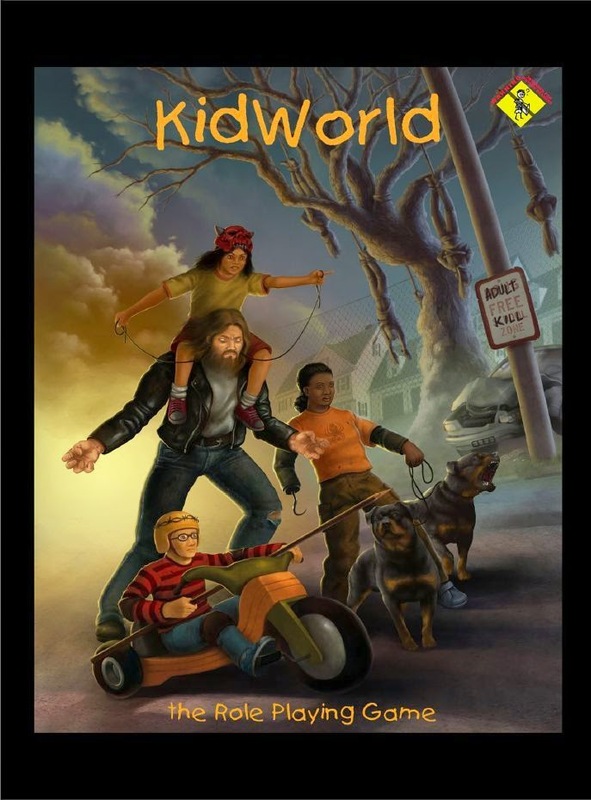 You can see those themes elsewhere, but KidWorld puts them together in a new way. Look at the cover with the child pulling the reins on a blinded biker or the hook-handed kid wrestling with two pit bulls. Despite the name, this game is as dark as you think it could be. It's a grim setting, and it opens with a warning about those themes. It reminds me a little of Grimm, Innocents or Monsters and Other Childish Things. But even those, for all their twisted dread, don't come close to the tone of KidWorld. Over half the book's given over to background, adventures, and some variant approaches. Those include a supernatural version where children's fears come to life, an imaginative power version, and a KidWorld LARP. There's a ton to like about the game and presentation, but...something about it kills me. You have some cool concepts- being able to play as a child, vision-impaired adolescent, or blind adult. I like how the kids have different roles (Builders, Ferals, Scouts, etc). And the game reinforces the tone through characters possessing cognitive deficits or being damned by nostalgia. However, all of that comes baked into a crunchy and detailed system. Character creation and rules take up the first 120 pages. That includes combat maneuver mechanics, attributes & sub-attributes, and a massive skill list. The game wants to be rich, demanding, and realistic. It follows in the footsteps of other thick apocalyptic games like Aftermath and Twilight 2000. And you may dig that. In my case I can see porting the substantial elements of this game over to something else. It would have to be a potentially lethal game or heavily narrative based. I'd be intrigued by an Apocalypse World hack. Despite those reservations, if the concept sounds at all interesting, I recommend checking KidWorld out. The whole thing's a great, creepy read. There's a strong military sub-current to many post-apocalyptic rpgs: Morrow Project, Twilight 2000, Sons of the Holocaust (It), Price of Freedom, and even some of Rifts. Terminus V is a massive 400+ page tome intended for use as an rpg and a miniatures game. (Like the more recent Wreck Age, which RPGGeek rejected for inclusion despite there being other hybrid games like this in their database, but that's another story). Terminus V takes place a hundred and twenty years after World War IV ("These go to eleven..."). While the book's intimidating, apparently a good chunk of that's fluff. I've seen the rules described as "simple," but my caveat would be that the speakers seem to be wargamers or miniatures enthusiasts. Most also describe finding it in a bargain bin. If tactical gaming's your focus, this might be worth checking out. 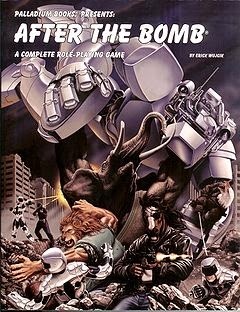 The 1986 version of After the Bomb remains one of my favorite supplements. Written for use with the Teenage Mutant Ninja Turtles rpg, but not married to it, ATB spawned a host of striking, fun, and colorful supplements. Fifteen years later, lacking a connection to TMNT, can a new edition stand up to the original? Presented as a done-in-one book, this smartly brings back Erick Wujick as lead writer (with, of course, Kevin Siembieda listed for Additional Text and Ideas). Let me begin with the elephant in the room. I love the look of the earlier material, particularly the Eastman and Laird illustrations. I count seven of those reappearing in this book, four as tiny images. That's a disappointment. But some of the new artists do an excellent job and come close- Kent Burles and Wayne Breaux, Jr. in particular. So the art's good, but the original's classic and more awesome. The new After the Bomb cleans up the text and mechanics. Early rpg products often threw logical organization to the wind. This takes a conventional approach and pulls together the relevant rules to make sections and transitions clear. But there’s a problem. This is a 224-page book. Of that, 164 pages are given over to character creation, mechanics, and equipment. Another 40 pages consist of several sample adventures. That leaves only about twenty pages for world background and setting. Some of that material naturally pops up in other sections, but overall you get a highly stripped down version of the original background. If you're looking for the world building of the old line in a single place, this isn't it. On the other hand, if you like Palladium and are looking for a crunchy system to play out a highly anthropomorphic post-apocalyptic future with a sketchy background you can alter, here you go. Some earlier Call of Cthulhu supplements set up campaign-ending holocausts or preludes to the victory of the Elder Gods. 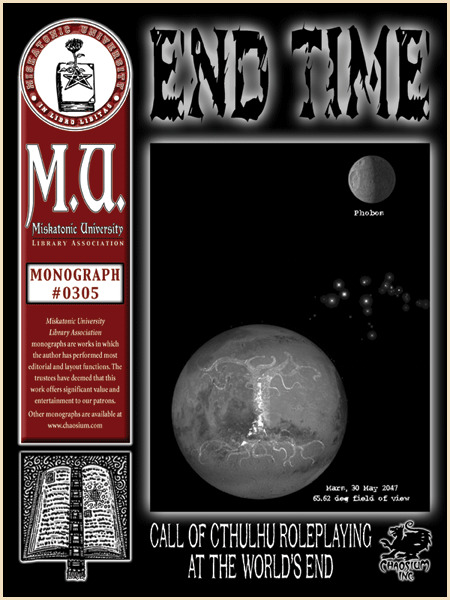 End Time offers the first post-Lovecraftian Armageddon, but it won't be the last. Yet End Time also draws away from confronting that head on. Instead it takes place on Mars in 2147. Survivors there have managed to escape the Great Old Ones' conquest of the Earth. End Time presents detailed standard and player timelines focusing on parallel threads: the evolution of the colony and the disaster which swallowed their homeworld. Earth actually falls in 2050, meaning the PC's colony has had about 100 years to establish itself and expand. It’s only about 2,100 souls at the suggested campaign start. There's the hint of a return expedition to Earth, but nearly all of the End Time's material focuses on the Martian colony. That includes details of the environment, colony structure, weirdly extensive new insanity rules which feel more generic than setting-specific, societal dynamics, and the Martian Dreamlands. There's also the expected CoC material: a Mythos glossary, new monsters, and new character creation options. The supplement notably leaves out any kind of adventure or details on NPCs. It will take work to get this ready to run. The version I looked at and Chaosium has for sale clocks in at 70+ pages, but I've seen it listed at 100+, so I don't know if that's a later edition. Eric Dodd has a thorough review here. 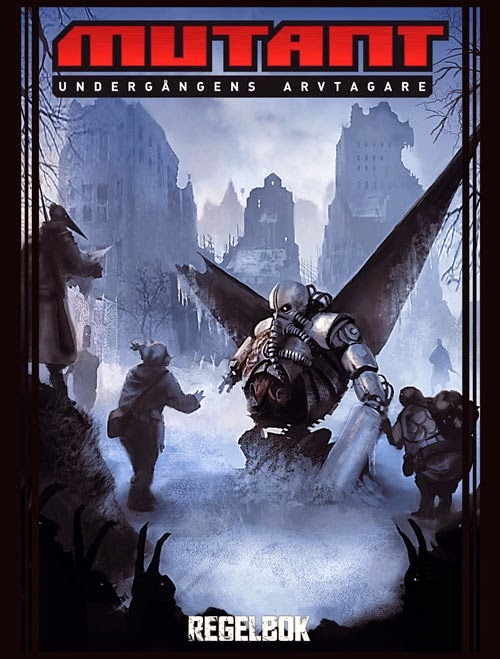 A German post-apocalyptic rpg with fantasy elements. An event called the Nadir leaves a decaying continent with fire on one end and ice on the other. Apparently tech levels vary widely from one extreme to the other as well. I've had trouble getting a better read on the setting than that. I've seen it described as dark and the art has a Warhammer-y look to it. The fantasy elements include all of the classics, though by different names. At the same time we have nuclear fallout and collapsed technology. Endland didn't get much support or attention, but did spawn a second edition. In 2011, a third edition appeared. That's available for free online (in German). A German game, some may also remember White Wolf's release of this in English. Engel (Angel in German), takes place in weird techno-fallen Western Europe six centuries in the future. Various natural and man-made catastrophes have ravaged the world, reducing humanity to a "Neo-Medieval" state. A new High Church dominates and controls the realm. And you play Angels sent to protect this world. I think. There's some cosmological set up there that honestly overwhelms me as I read through. Engel has three pages of tiny-type lexicon listings. I know there's an Adversary called the Dreamseed. Play seems to revolve around battling that force at the behest of the Pontifex. There's political battles as well, within the Church and with breakaway regions clinging to old technology. 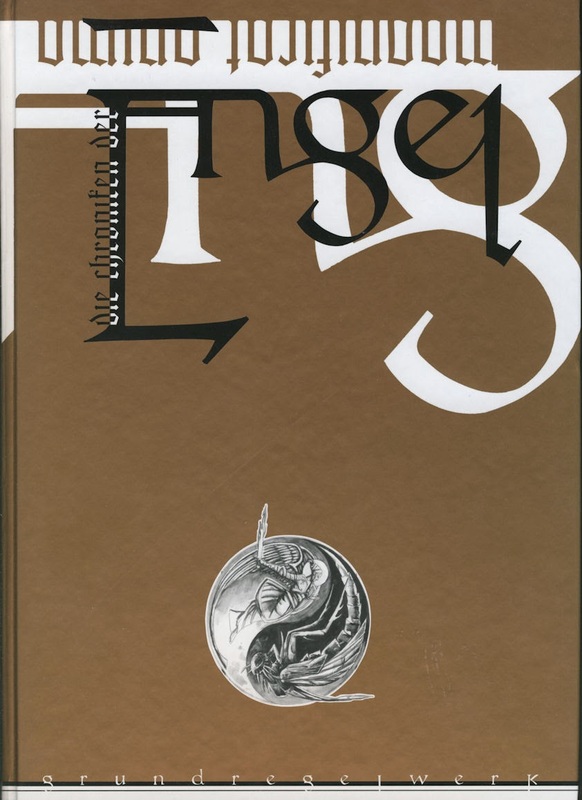 The original German edition of Engel used tarot-like cards for resolution. White Wolf's version ditches that in favor of the alternate d20 mechanics. The original has decent support- with a half-dozen+ large splat books and an updated version adding 3.5 mechanics. White Wolf released two Angelic Order splat books and a monster supplement. Another French sub-aquatic post-apocalyptic rpg. Subabysse has, if I'm right, eight editions, some being minor corrections and updates. The most recent (2012) looks amazing; check out this overview video. I’m in awe that the French market managed to support two underwater post-holocaust rpgs through multiple editions (the other being Polaris (1997)). 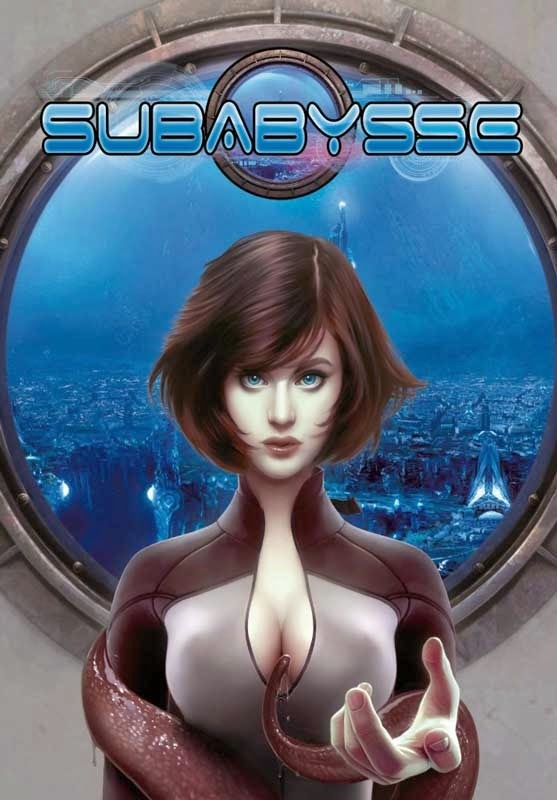 In Subabysse a forgotten cataclysm renders the 10% remaining surface world uninhabitable and pushes society into the oceans. Three centuries have now passed. That time has created social, political, and physical rifts among the population. The rpg takes a more sci-fi bent, considering questions of technology and genetic changes. Players can be humans, mutants, or exotic Atlanteans. I wonder if we'll ever see English translations of either of these games? Or does the limited success of Blue Planet make that a non-starter? A French RPG, Cendres means "Ashes." It opens with an apocalypse, one it takes pains to avoid describing. You know world's fallen, just move on. It takes place about a hundred years after this obscured event. The world remains caught between survival and restoring the past. Focused on Europe, Cendres is a classic survival game. It doesn't appear to have any of the fantastical trappings of other games- no mutants, psychics, robots. It's more in the vein of The Road than anything else. The background materials suggest secrets and present a rich environment to explore. The character sheet looks particularly crunchy, with main characteristics, sub-attributes, and an extensive skill/talent system. 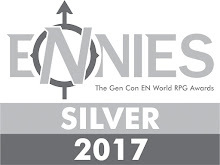 Cendres got modest support over several years: a GM screen, and two region sourcebooks. And so it begins…this the first d20 post-apocalypse game. Well technically I guess Engel is, but there's the confusion over the original system vs. d20, so let's go with this. My other histories have made me gunshy about this period. I've seen before a flood of d20 games, some interesting and some painful to read. Will the same hold true with this genre? At least this opens with a solid and clearly crafted rpg which has legs. 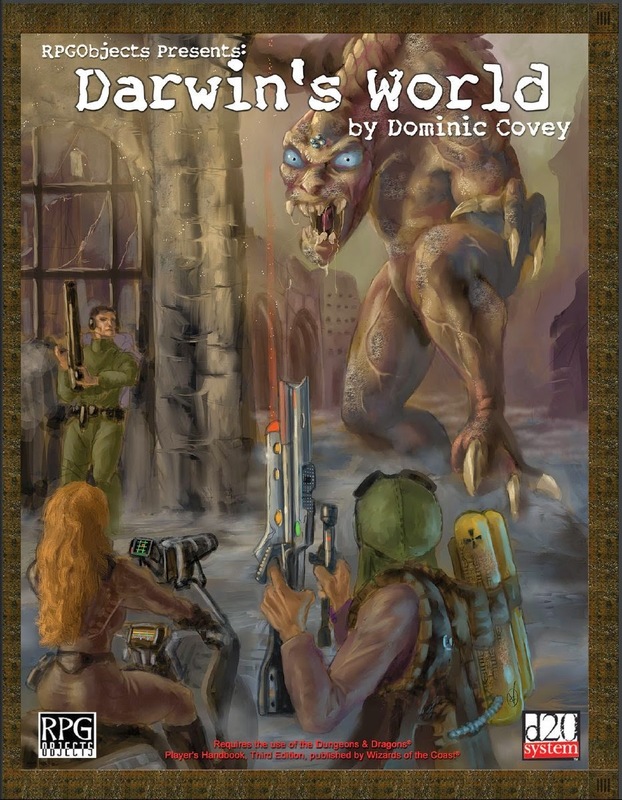 While this first edition of Darwin's World arrived in 2002, the second hit a year later using d20 Modern. The publisher has released new material for it as recently as 2013. Darwin's World has a detailed alternate history. The US returns to isolationism following WW2. As a result a coalition of various European and Asian powers invade during the early 2000's. This sets off a series of wars devastating humanity. Now we're an uncertain span of time later. In one place it says decades and in others that no one knows. But clearly several generations have passed, allowing the rise of monstrous mutations caused by wartime fallout. Players can be humans or one of three generations of mutants. That's further modified by choice of community. Darwin's World has five new base classes (Guardians, Raiders, Scavs, Thinkers, and Traders). There's the obligatory dozen prestige classes as well. The rules modify the skill list and offer a not-too-crazy list of new feats. It feels restrained compared to other d20 adaptations. Mutants pick their features rather than randomly generating them. The game classes these as minor, moderate, and major, with access differing between generations. Defects offset these. Darwin's World has nice material on artifacts and equipment, with some pretty sci-fi high-tech. It has a little Gamma World feel, but without quite the gonzo. Darwin's World is a clean and decently put together set of d20 rules for post-apocalyptic. It leaves out some survival elements, but that might be expanded by the supplements. The background material's pretty thin, about 10% of the total content. GMs will either have to bring the mechanics over to another setting, spin out quite a bit from what's here, or buy the other sourcebooks. Woot!!! Mutant's back on these lists. This Swedish rpg family gives Gamma World a run for its money on reboots, retoolings, and republications. Google translates that subtitle as "Doom Heir," but I prefer the more poetic "The inheritors of the apocalypse" mentioned on the Geek. Mutant: UA actually goes back to the setting of the original Mutant. You may recall the crazy robed figure, Carebear rainbow attack, and satellite dish from its cover. This brings back the weirdness: players can once again play mutated humans and awesome mutated animals. Like Gamma World, Mutant: UA has a mish-mash of technology levels and a mythology-shrouded history. A couple of places describe it as slightly darker than the original, and the cover design certainly reflects that. It looks like Mutant: UA had at least a dozen supplements, with the last in 2008. A two-volume, third-party, post-apocalyptic supplement for EABA. The players book is a little over 100 pages and the GM's a little under 200. The cover, at least of the GM book, is odd and clip-arty. Road to Armageddon's premise is that soldiers from the 21st Century fight alongside WW2 troops and 27th Century warriors against some kind of future Armageddon. The material seems to contain a hefty amount of weapon and equipment tables for this detail-rich rpg. It falls very much into the realm of hard military science-fiction. EABA focuses on weapon design and modeling these kinds of elements, so it makes sense. Multiverser offers an interesting rpg concept. You play a single character moving through to different dimensions as they die. Multiverser: the Second Book of Worlds (2000) presents an anthology of new world settings, what we'd today see as mini-campaigns or variations (think jim pinto's Protocol Game Series). It includes "New Ice Age," a modern frozen wasteland and "Industrial Complex," a world slipping into technological collapse. 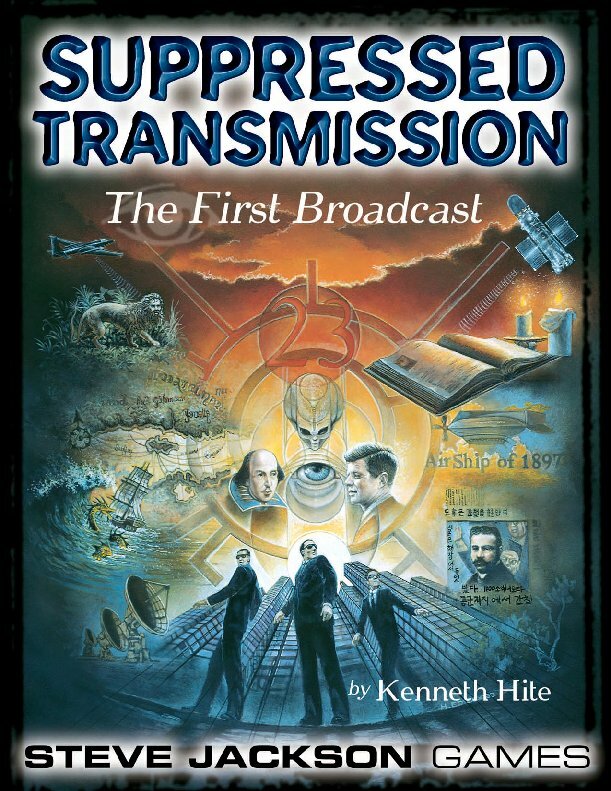 As well Ken Hite's awesome Suppressed Transmission (2001) anthologies, “The First Broadcast” and “The Second Broadcast,” include post-apocalyptic material. I'm not going to point to any particular entry, since they're all awesome. GMs should be mining this stuff like diamonds. Some players just want to see the world not burn, so we have anti-Armageddon games and supplements. Purgatory: Special Edition (2001) has supernaturally-imbued characters choosing sides in the coming battle between Good and Evil. It plays with the divine, Western religious elements we've seen elsewhere. Likewise, The Seventh Seal (2002) is a Biblical game. You plays as righteous Sentinels, trying to hold back the tide of evil and coming end times. Alternately, you could go full pagan with Ragnarok! 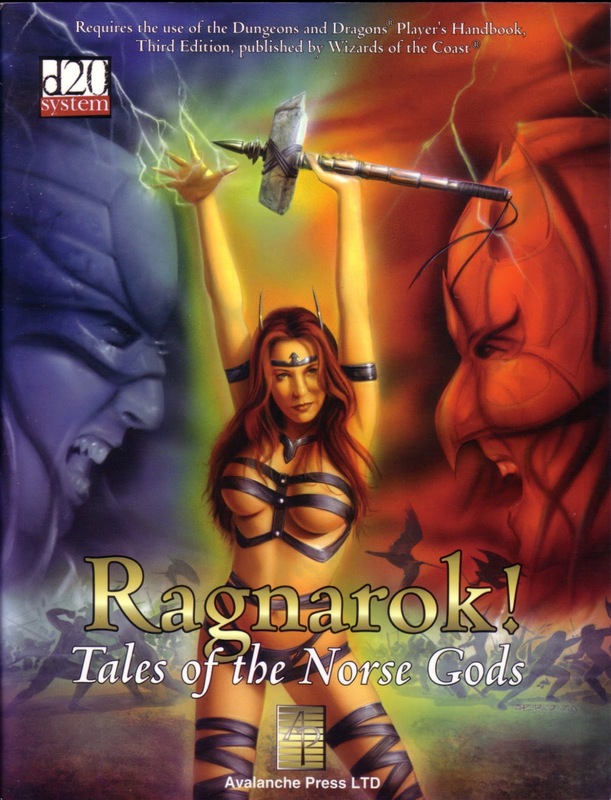 Tales of the Norse Gods (2001) and Doom of Odin: Tales of the Norse Gods (2002). These include d20 material for playing as Asgardians struggling against the Twilight of the Gods. As an added bonus you get Avalanche Press' trademark impractical cheesecake covers. For more conventional fantasy, WotC's The Apocalypse Stone (2000) has a certain irony. Among the last AD&D products published by the company, it presents a campaign-destroying toolbox. The players can battle against a horde of troubles and perhaps win (unlike TSR). 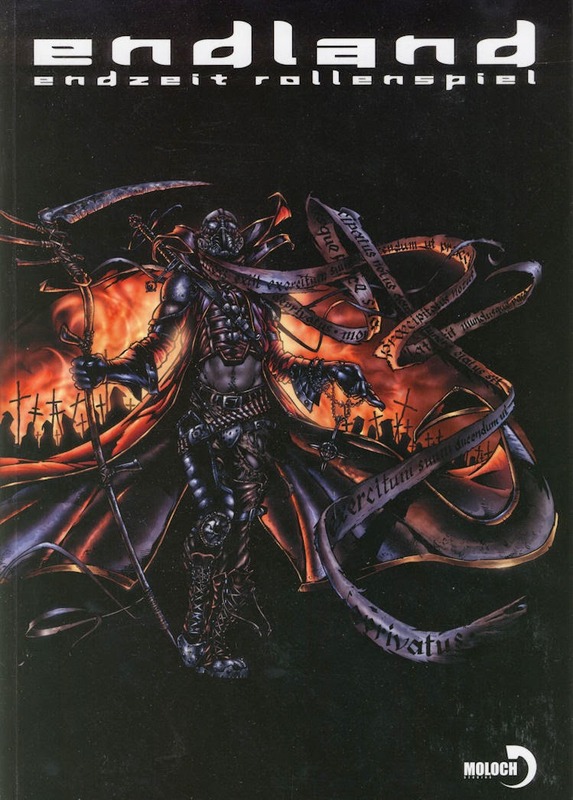 Or if you just want to have the players annihilate the setting, you can go with Charnel Gods (2002), a supplement for Sorcerer. There players seek out Fell Weapons in order to bring the apocalypse. So that’s fun. If you've gotten this far, consider supporting my Patreon campaign. Or at least reshare this to spread the word.